Consumers battered by a multitude of economic woes came roaring back in November, pushing retail sales up by the largest amount in four months. The nation's retailers saw sales rise by 1 percent last month, following three straight months of lackluster performance. Sales were flat in August and had fallen in September and October. The November gain, which was the best showing since a 1.4 percent increase in July, was coming at a critical time at the start of the holiday shopping season. In other news, the amount of inventories held on shelves and backlots rose by 0.4 percent in October, after a 0.3 percent increase in September. The increase in inventories was slightly below the 0.5 percent that economists had been expecting but followed the pattern of moderate increases as businesses have succeeded in keeping inventories under control even as the overall economy has slowed this year. The November retail sales performance was 10 times better than the tiny 0.1 percent rise that economists had been forecasting. Still, it was unclear whether the boom seen in November would carry over through the entire Christmas shopping season. Some economists cautioned that the November jump could turn out to be a one-month blip rather than the start of a trend of stronger sales. "We think it is very likely that sales will either be revised down or there will be a hefty drop in December," said Ian Shepherdson, chief U.S. economist at High Frequency Economics. But other analysts said the rebound, while much stronger than expected, fit with their view that consumer spending this holiday season will post solid, if not spectacular, gains. Many retail stores reported that customer traffic has not been as strong after a surge right after Thanksgiving when consumers were lured into stores to take advantage of attractive incentive deals. Consumer spending slowed dramatically in the spring and summer as Americans were hit with surging gasoline prices, which left them with little to spend on other items. They also had to deal early in the year with rising interest rates, which made their credit-card purchases more expensive, and with a cooling housing market, which made them feel less wealthy as the values of their homes slipped. "My confidence in the economy is a little lower than it was last year at this point," Mike Gorham, who works in real estate, told CBS News correspondent Anthony Mason. "That's gonna influence my spending." However, economists believe consumer spending is now stabilizing, reflecting in part the retreat in gasoline prices from the record highs above $3 per gallon set in the summer. 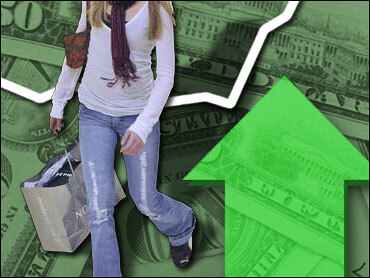 Consumer spending is closely watched because it accounts for two-thirds of total economic activity. The 1 percent November increase reflected widespread strength in a number of areas, led by a 4.6 percent surge at electronics and appliance stores as customers snapped up the latest flat-screen televisions for holiday gift giving. Sales at auto stores posted a solid 0.9 percent increase, which followed a 1 percent rise in October. Department stores and other general merchandise stores posted a 0.4 percent rise in November, a rebound after a 0.3 percent fall in October. However, sales at specialty clothing stores were unchanged in November and sales at furniture stores edged down 0.1 percent after an even bigger 0.7 percent fall in October, weakness that reflected the big slowdown in home sales this year. Sales at gasoline stations were up 2.3 percent in November following a 5.3 percent decline in October, a drop that reflected falling pump prices rather than a lower volume of sales. Excluding autos, sales were still up a solid 0.9 percent in November.